I once heard that in terms of dedication to their children and families, mothers are all alike around the world. The only thing different between my mother, your mother, their mother, his or her mother is the address. My mother is not different. And one special characteristic of hers is that she always has great words of wisdom to offer and to me they have always carried a lot of common sense. I continue to learn from her each time I talk to her. Sponsored by the University of Oregon, this last Friday the Dalai Lama was here in Eugene and he spoke to a sold out Matthew Knight Arena. The University streamed his speech to all faculty and staff, so I pointed my browser to it and saw the video and listened to his speech among a work email and another. Lots of common sense types of words, deceptively simple in his approach and delivery of his words. I don’t know what I was expecting, or if I should be expecting more. Perhaps simplicity and common sense is his message. Some of the staged questions could have led to some hot topics. But his answers showed the strategy was clearly to stay away from anything that could generate one ounce of controversy. Always simple and to a point, and applying common sense. He reminded me of my mother and I don’t think he would get offended by that. Among the many common sense ideas the Dalai Lama brought up, one thing he said caught my attention more closely, perhaps because it was close to mother’s day: “Mothers, love your children!” he advised on a very emphatic tone. “This is one of the most fundamental aspects of life and to the well being of the world,” he continued (paraphrased here, I don’t remember his exact words). I agree with the Dalai Lama on that one. And I’m lucky to be on the receiving end of that love. I write this post on mother’s day, and dedicate it to my mother and to all mothers and also to all the women who play a mother’s role to someone! 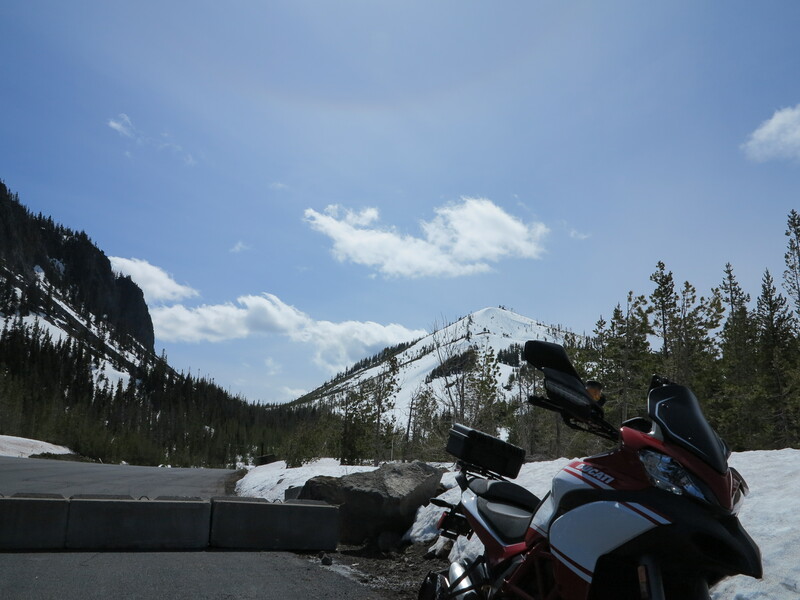 This post is about a ride that took place on Sunday, April 28th, when I went to Sisters to check the snow level at the areas around Santiam pass and the Sisters’ areas. I’m late with my posts as you can see. I’m having too much fun riding, spending too much time working, in the end, not enough time writing. Besides this current post I have three more completed rides to document which I will be preparing and posting in the next few weeks. I won’t be riding much in these next few weeks, I will use the time to work in my garage. I started reorganizing it over the last part of the winter, which included the construction of two lean-to structures for storage of garden tools and other materials. But then the new bike arrived and all work stopped. The bike completely derailed my plans, all I wanted to do was ride it. But it is time to finish that work, a few things still need to be done. And I have plenty of rides planned for that bike in the near future. It is Spring and the Eastern Oregon farmers and fire fighters already know this coming year will be a drought year. Oregon’s rain season has been short this year, snow accumulation was less than normal, we are bracing ourselves for a drought year and its consequences (see chart below from NOAA). The week before I went to Crater Lake National Park and checked the snow level in that area. It is reported to be at 60-70% of what are considered average snow levels for a winter season in that park. And with this post here I’m reporting my ride to check the state of roads around the Sisters’ area. 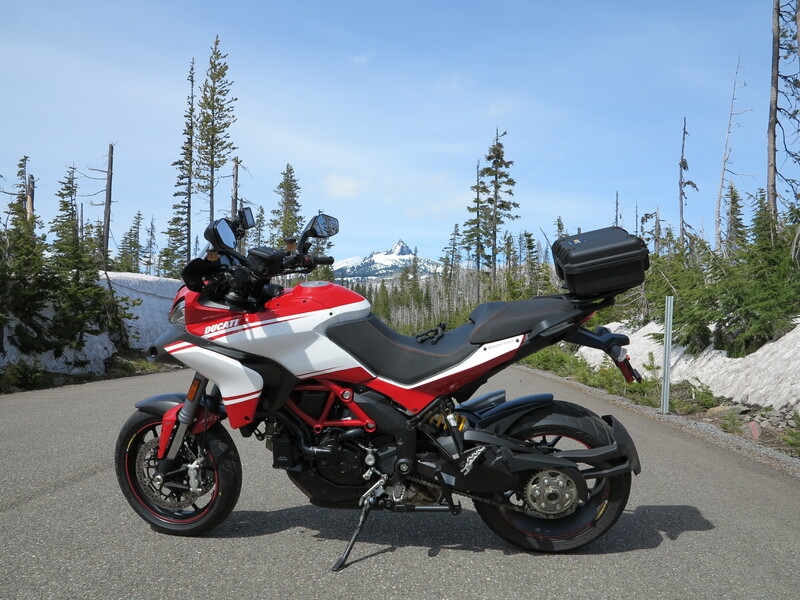 Just the day before I had washed the Ducati from my ride to the Crater Lake. This bike had a layer of a mix of the water from melting snow and dust from the red volcanic sand that is laid on the road to help with traction on icy days. I’m on a “keep the bikes clean” mode these days. After washing it I went for for a short ride to dry it. I went to a very conveniently located new gas station in my area, just three miles away, that sells non-ethanol gas. This Chevron gas station has about a dozen pumps distributed in three islands. Right in the middle of the middle island there is one special pump, Sunoco it says, and it is supplied by Tyree fuels, the attendant tells me. 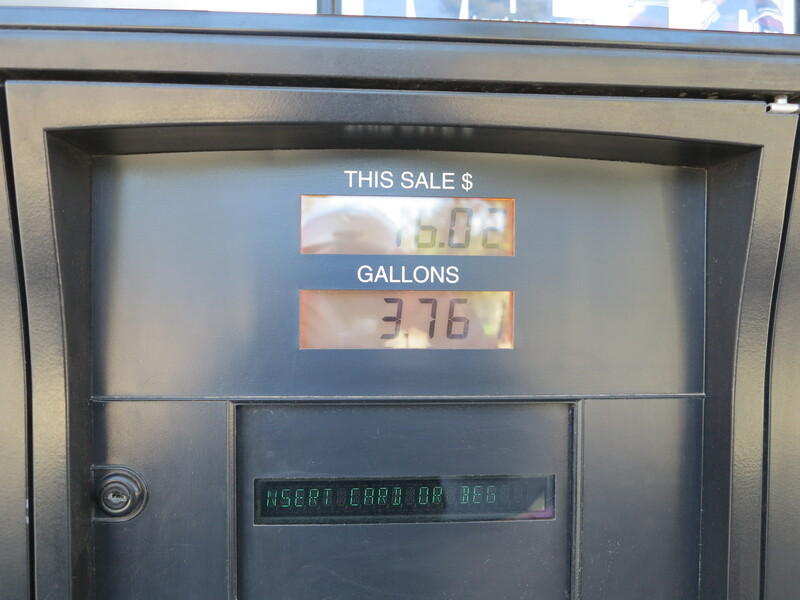 On the left side of this Sunoco pump you get 92 octane non-ethanol gasoline, which is what I use. On the right side of this pump you get 100 octane race fuel or 110 octane leaded race fuel. I don’t know who uses race fuel here, but the 100 octane unleaded is expensive, at $8.99 a gallon. The 110 leaded was $8.39 a gallon. The 92 non-ethanol I use is not cheap either at $4.50 or thereabouts. I don’t mind paying the price to run my machines with as little ethanol as possible, including my lawn mower. 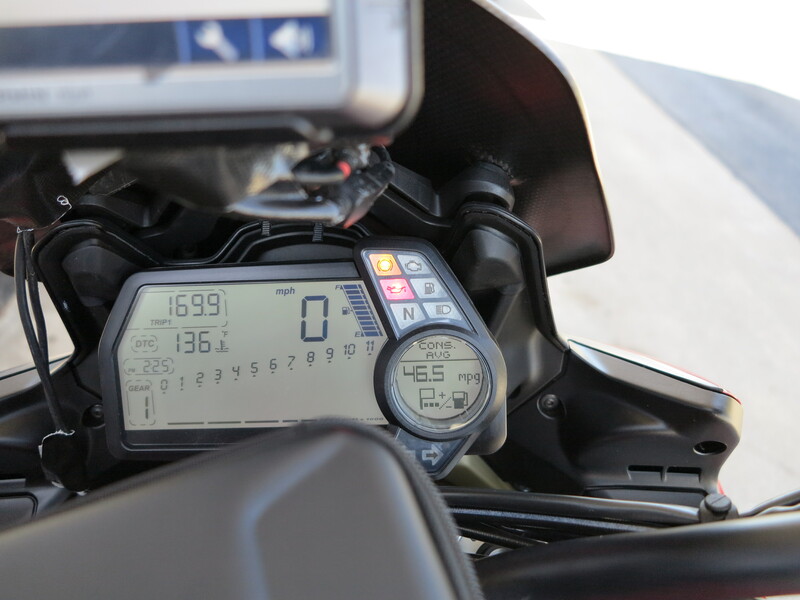 Before I left for this ride Sunday morning, I changed the bike’s screen back to the smaller carbon fiber Pikes Peak screen. It looks better and gives me more clean air on shoulders and head. 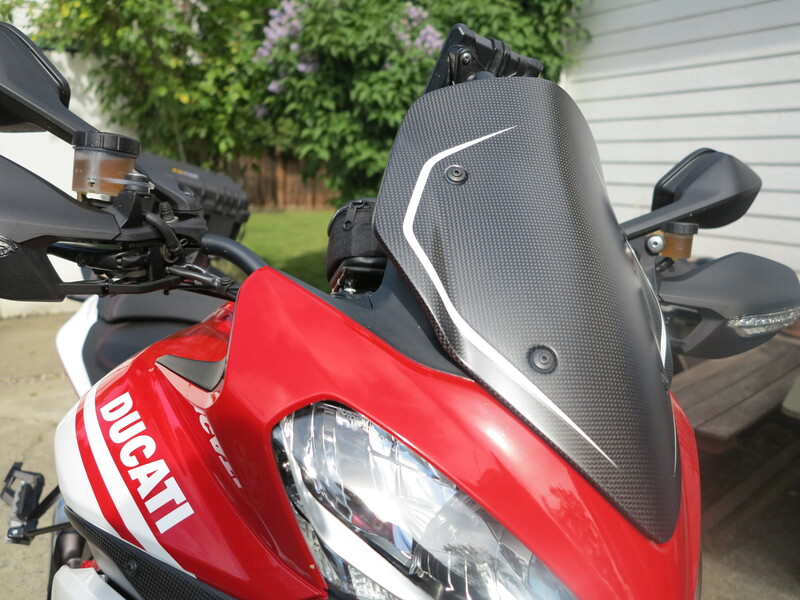 There is still turbulence even with this set up, but I believe it is coming from the bike’s front fairing and mirrors and not necessarily the screen. 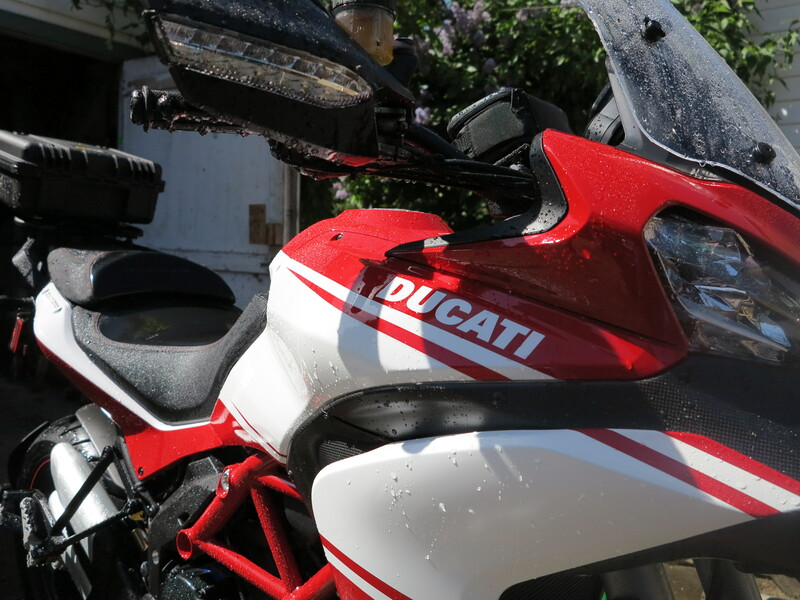 One thing I liked about the Hyperstrada I rode the day before this ride, is that you only get clean air. In that case, all you need is a good quiet helmet and you are good to go. Because 242, the McKenzie pass road, is still closed, I decided to go up the Cascades via Hwy 20 instead of the busier 126. And to make things yet more peaceful and relaxing, I took the usually empty back roads north of Eugene to connect with 20 by Sweet Home. I let the GPS pick the specific roads on that route and was surprised by a nice and new to me stretch of road connecting Harrisburg to Brownsville, crossing I-5. The emptiness of these roads put me on a very relaxed mode. Only thing bothering me were the grey skies with a slight threat of rain. The road is the Diamond Hill Rd, going east from Harrisburg and connecting with the Gap Rd to go north towards Brownsville, snaking a bit through the lower part of the Coburg Hills to the right. I entered Brownsville from the south and connected with 228, now going east towards the Cascades. The grey skies can be threatening, but at the same time it brings life to colors, everything gets brighter and more intensive. 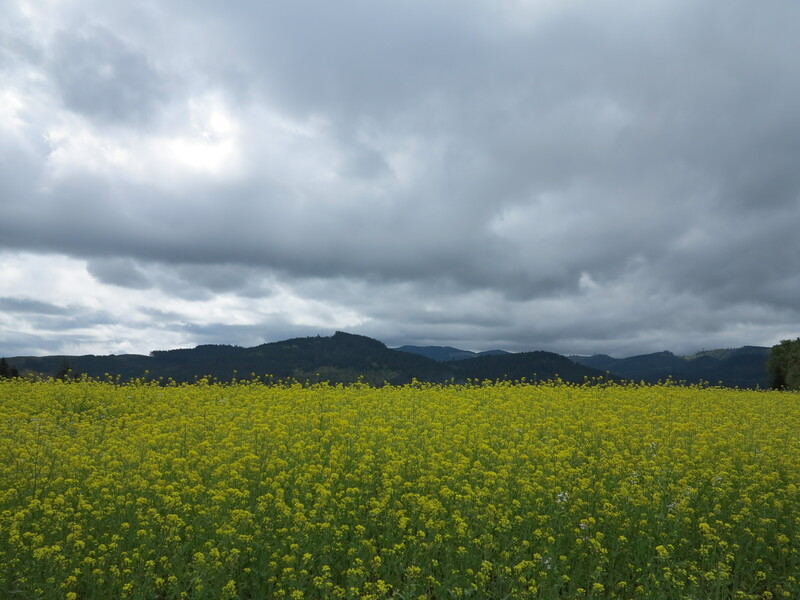 Like the effect it gave to these bright yellow flowers of these canola (I think) fields just outside Brownsville. I had never ridden 228 from west to east. Going this direction, it allowed me to see a small park dedicated to the Calapooia watershed, something I had never noticed before. I stopped to take a look and document the Calapooia river. I learned from this stop that a watershed council was put together not too long ago to improve conditions of this river. 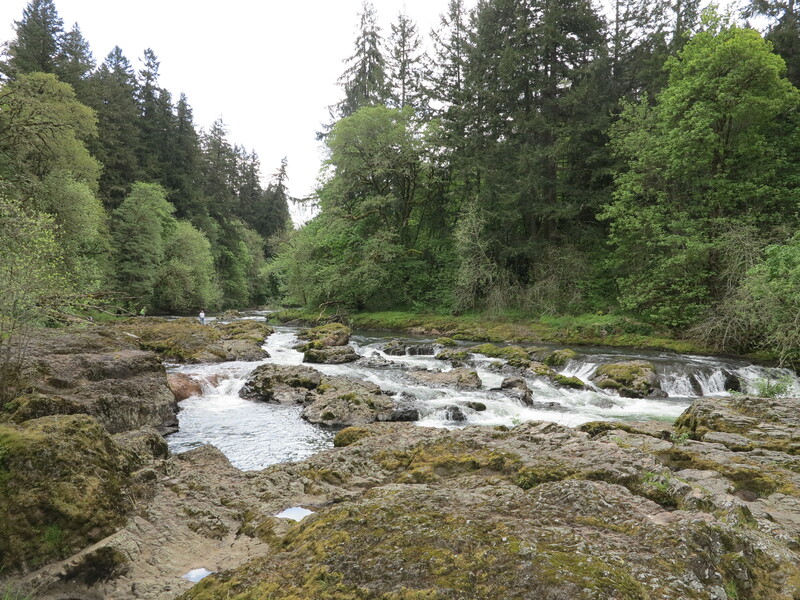 They worked with the farmers to improve their practices, providing the once threatened spring Chinook and winter Steelhead with higher quality spawning grounds upstream. Every little effort counts. In the end farmers, the public, and all who like to fish win. Continuing up the road on 228 I arrived in Sweet Home to take Hwy 20 and start my climb of the Cascades. 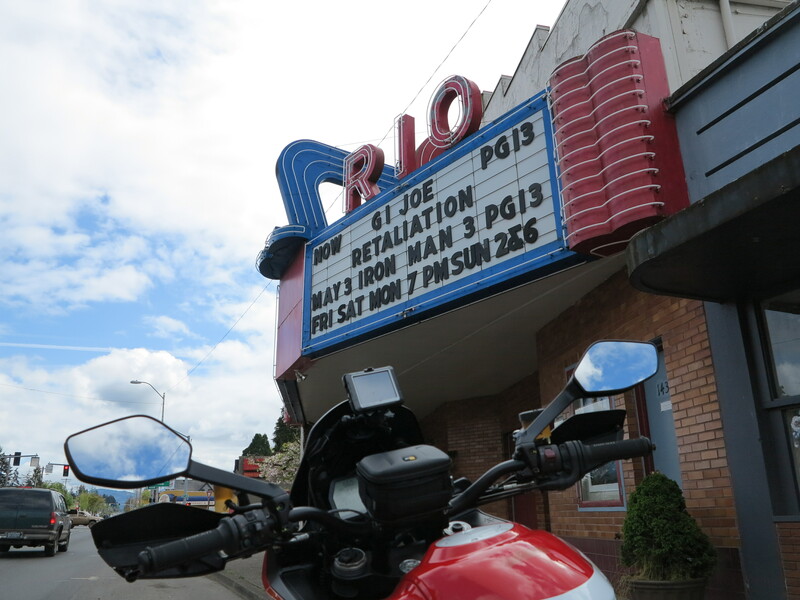 While in Sweet Home I stopped to document this movie theater, called Rio. That name had caught my attention before, I had noticed it on previous rides through this area. Perhaps it is named after Rio de Janeiro, which is known simply by “Rio” in Brazil? The Dakar with the Rio Movie Theater in the background. Sweet Home, September 2009. There is something about stand-alone movie theaters, I especially like the art deco buildings. But there is more to it, regarding the experience of going to the movies, parking in front of it. Who didn’t take a date to the movies? And there is the building itself, and the street experience of walking out of an intense movie back into reality. Porto Alegre, where I grew up, had at least 15 stand-alone movie theaters of this type. I remember every other Sunday my father’s side of the family had lunch at my grandparents house and after lunch some of us, the 8 grandchildren, when we were pre-teens I suppose, would go to the movies. The matinée session. We would check on the newspaper the various options during lunch, have a little debate among us and pick one of the movies. I don’t think any of those movie theaters in Porto Alegre survived the multiplex and movies-at-the-mall invasion that happened here and also there in Brazil. Perhaps some of those nice buildings survived, but I doubt they work as cinema houses these days. And here in Oregon, in this small town, they are still alive! Very nice indeed. On a closer look, I noticed a poster, close to the box office, and learned something new. If you like these old movie theaters, there is an initiative called “save America’s Cinemas“. Their goal is to save America’s small town cinemas, especially the ones going through the costly transaction of digitizing their projecting equipment in replacement of the 35 mm or 70 mm film projectors. Just this last week I heard on Oregon Public Radio that Eugene’s Bijou theater is going through this very process and they are asking for support from the community. From Sweet Home I continued east on Hwy 20 and started the climb of the Cascades, towards its highest pass of this portion of the road, Tombstone pass. This portion of Hwy 20 is nice, with less traffic than Hwy 126 (Hwy 126 connects to Hwy 20 at some point). At some point I was looking at the scenery to the right of the road and somehow the green of the trees brought me memories of a postcard my father had sent to our family, from a business trip he had made to São Paulo. That was a long time ago! One of the things I’ve been enjoying as years pass are the unexpected moments that bring back memories of long time ago. I enjoy thinking about those moments and try to learn something new from them, seeing them from a grown up perspective. Well, sort of grown up. This one moment in particular was about the postcard my father sent back to the family, and I’m not sure whether he had sent it to me only or to everyone in the family (very likely it was to everyone in the family). But I remember I appropriated it as if he had sent it to me only and kept it and stared at it many, many times. It probably had dog ears and all. 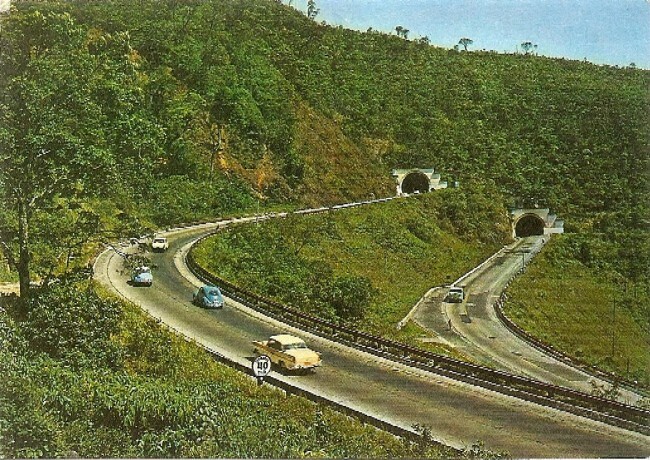 The postcard was a photo of a stretch of road on the mountains on the way to São Paulo, with many curves and a tunnel. Not quite like the postcard I just found on the internet and posted here (below). The way I remember it, it had a darker tone of green for the trees, and the photo had been taken more from a distance. But the one below is close enough. It is in Brazil as well and near São Paulo. The point is, based on then and now, it seems I’m consistent in what I like. Riding these curvy roads makes a lot of sense. The other point is that the past can tell new stories. And teach new lessons. Old postcard of Highway in Brazil, near São Paulo. After Tombstone Pass Hwy 20 goes down the mountain and merges with 126. Merging with Hwy 126 and its traffic brought me out of my contemplative status. 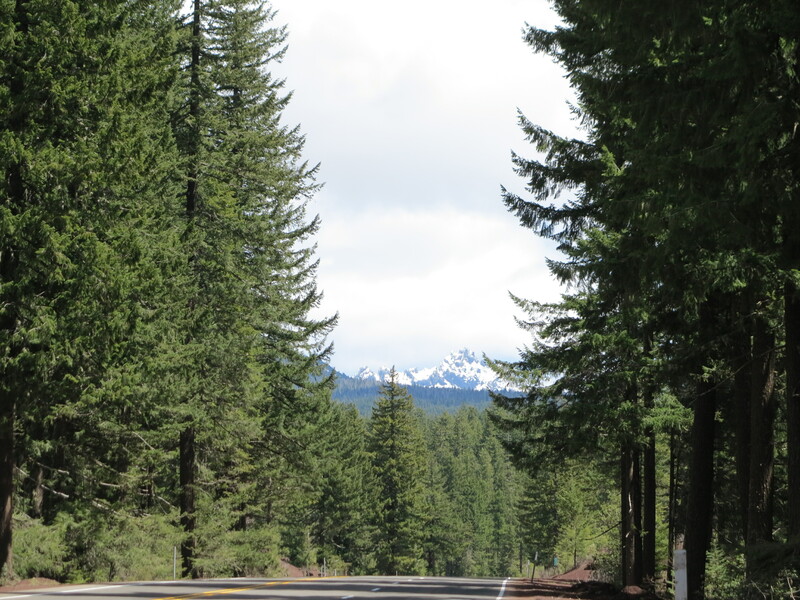 The 20/126 combined climbs a bit more to reach Santiam pass and from there Sisters is very close. Before fueling up in Sisters I decided to first see how far I could go on 242. 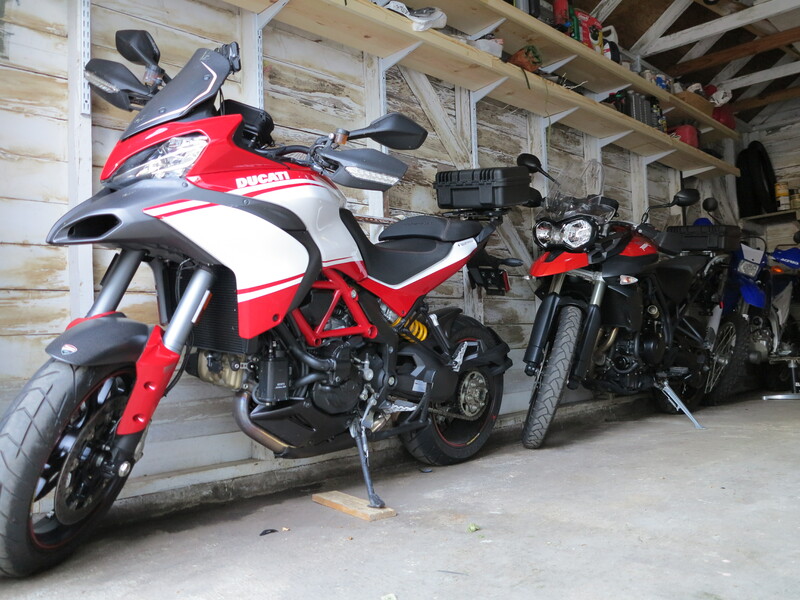 It gave me an opportunity to introduce the Multistrada to the three Sisters. All my bikes meet them sooner or later, it’s a ritual. I had heard 242 was still closed, but I was wondering how far I could go. Not too far, I found out, despite no signs of snow. 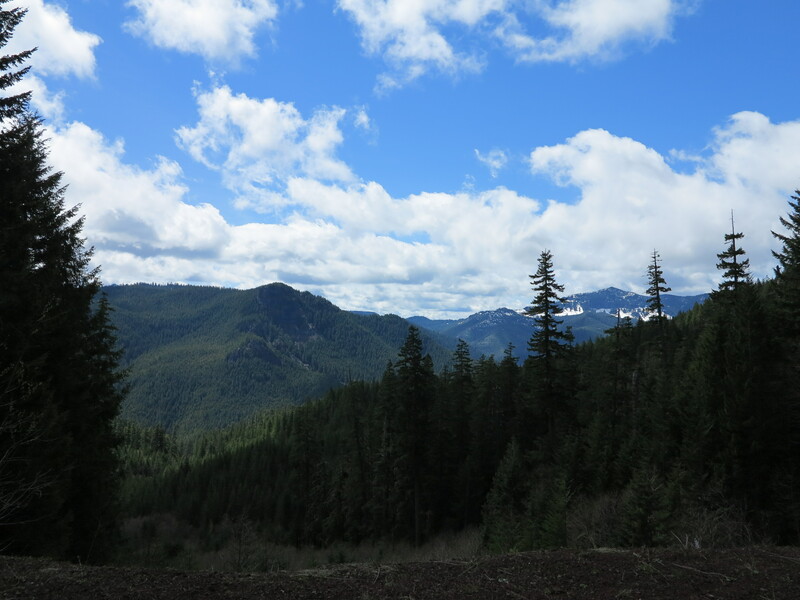 I went back down towards Sisters and tried the Three Creek Lake Rd, that goes a bit more directly towards the south, a parallel direction to the Cascades. View of session if the Cascades from Three Creek Lake Rd. I rode on it for a while, till I reached a closed gate as well. A guy showed up on a truck and started talking to me, telling me something about the gate and not understanding why it was closed. Or something similar. I had my helmet on and the earplugs, I could not understand a word he was saying on top of his truck’s running motor. A smile here and a head nod there and I went back to my bike. 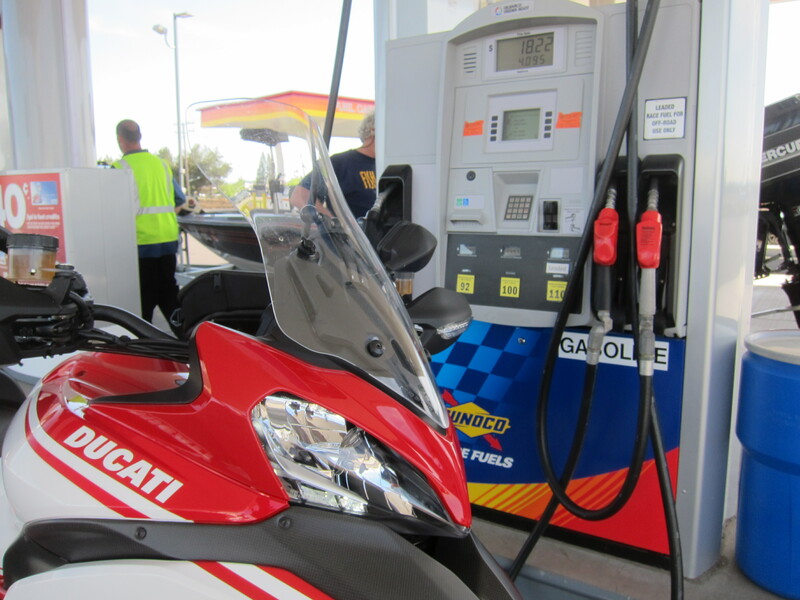 By the way, at gas stations I usually don’t remove my helmet, so I point to the fuel I want, give the card and the rest is yes and no and common sense (the word of the day, it seems). Three Creek Lake Rd. Closed as well. I resigned to go back to Sisters. Conclusion: no snow on site but roads not open yet. I hear 242 will be open soon. 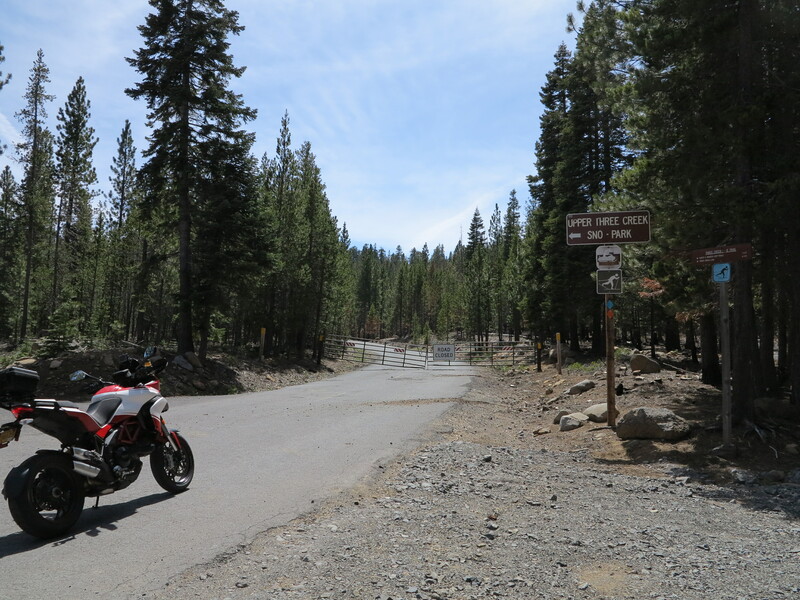 The Cascades Lakes road was opened recently (I rode on it yesterday, May 11). Sisters reminds me of the time I was in a masters degree program on City and Regional Planning at the Ohio State University. When you go to Sisters you know they’ve planned its construction code to make it work as a good business enterprise, a touristic destination with its western theme throughout the downtown area. But they also make it a place that compels people driving through to stop and check it out. Highway traffic is forced through a main thoroughfare at very slow speeds. 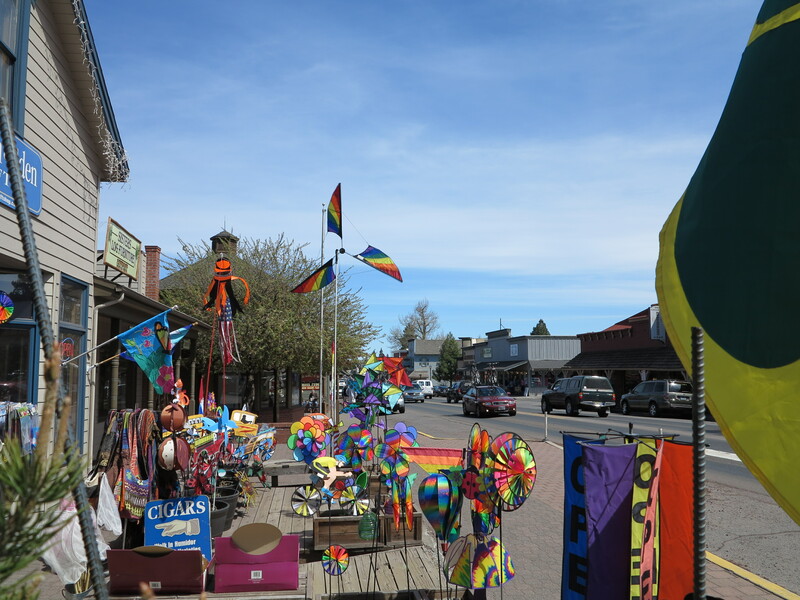 It is a road that is friendly to pedestrians, not too wide so that business on either side of the road can still be connected with each other, making it a community of sorts. Once you are there you can’t quite tell there is a highway going through the town. But when you are driving, you know you entered a town. You can park your car (or motorcycle) and walk to several of the establishments that are close to each other on both sides of the road and the next block as well. The side streets offer plenty of parking options. 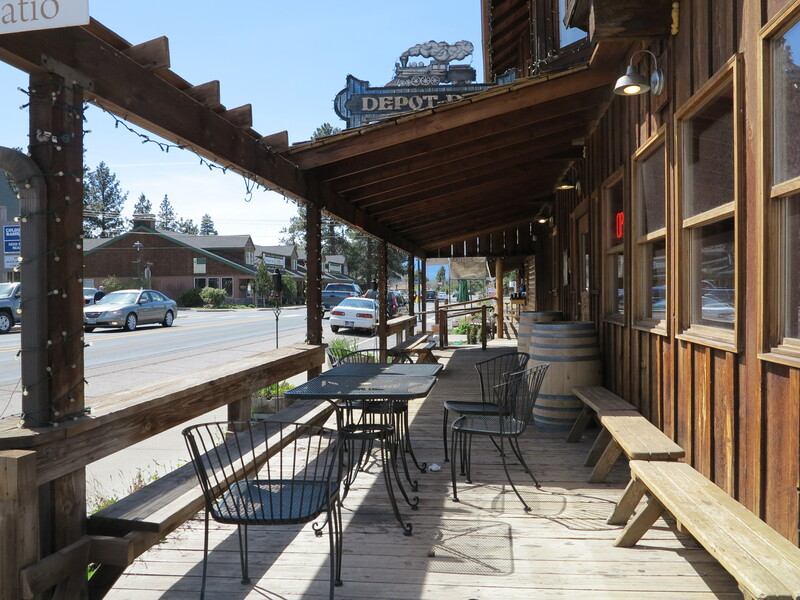 During the summer months the side walks, stores, and cafes get busier with people from everywhere. I stopped by the Space Age gas station, at my usual non-ethanol fuel pump. I have been very impressed with this bike’s fuel economy. It has been consistently averaging above 45 mpg, giving me a theoretical range of more than 200 miles if its tank really holds the 5.3 gallons it says in the manual. The display indicates 46.5 mpg. The actual consumption calculated: 169.9 miles driven divided by 3.761 gallons, makes 45.2 mpg. I’m not riding this bike on cruise mode at all times. Well, I admit, overall, on straight roads, I only speed up when I have to pass slower vehicles. I try to keep the speed between 60 and let’s say 75 mph, maybe a bit more on empty open roads and those long sweeping curves. Once I hit the tighter curves I have a bit more fun on higher RPM, but in lower gears. I’m not taking it to the edge of the tires, but it goes fast enough. That is, I’m not babying it and I’m not a racer either. 3.761 actual gallons consumed in 169.9 miles. And I’m always on 150 high mode, be it on Touring or Sport modes. I also have it set up for 150 high on Urban, but I’m on Urban mode only when I want the bike lower to the ground for maneuvering purposes and sometimes stop and go traffic. The bike keeps telling me that I have 200+ miles of range, tank after tank. Not bad at all. It could be the non-ethanol gasoline. It does better than my Streetfighter did! From Sisters I went back home the easy way, via Hwy 20 and then 126. 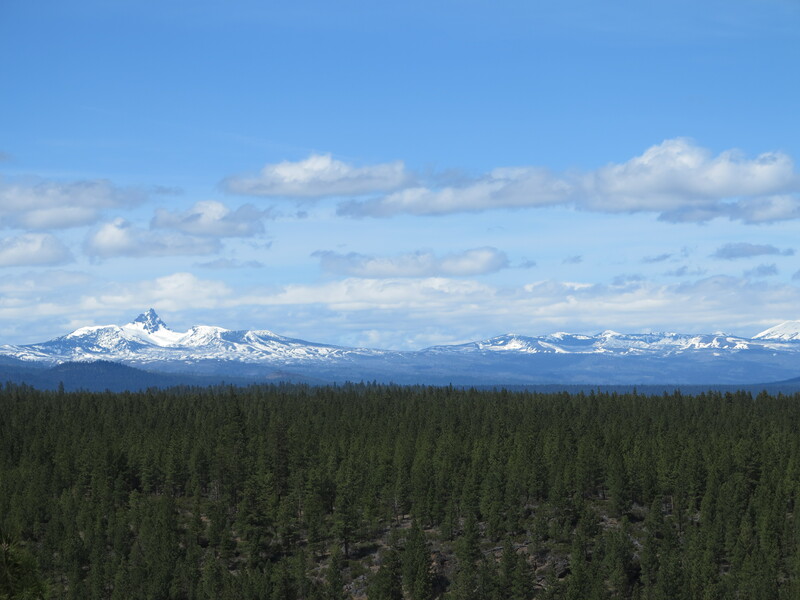 On the way I stopped at the Santiam pass and checked the Hoodoo ski area. 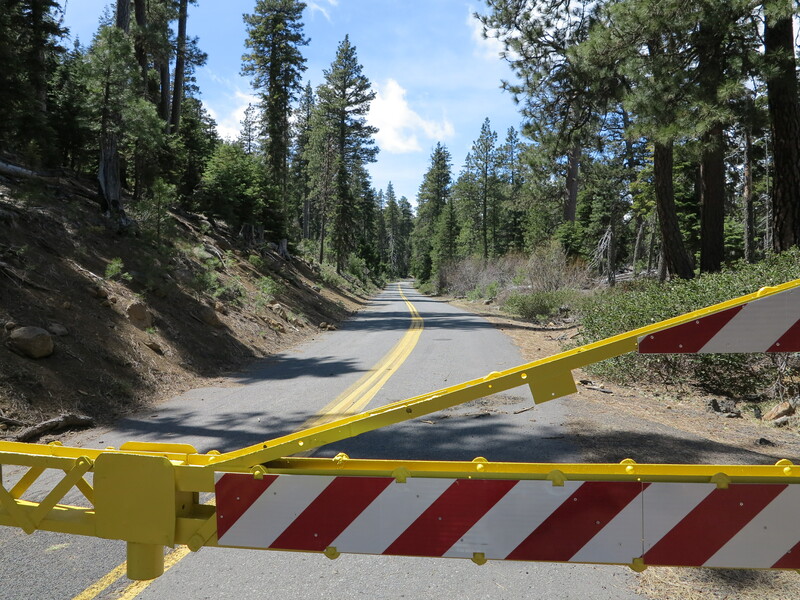 Another closed road and another closed ski station. Hoodoo Ski Area: Closed for the season. The bike looks good with snow and trees on the background. 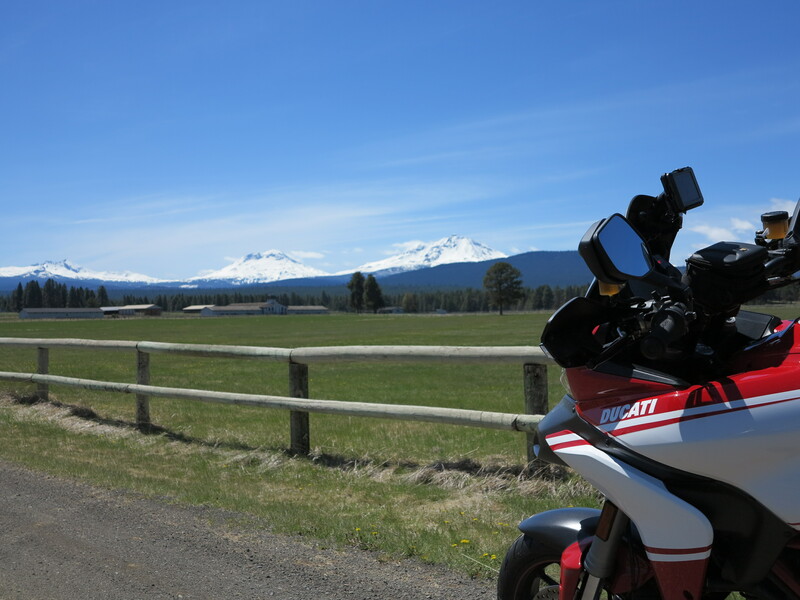 At Santiam Pass with Three Fingered Jack on the background. And I’ve never had a chance for a photo op with the bike. So here it goes. It looks great in black and white. As a matter of fact, I bet it will really look great if the red parts were painted dark grey. I continued on my way home with no more stops. 273 miles, about 440 km total for the trip. 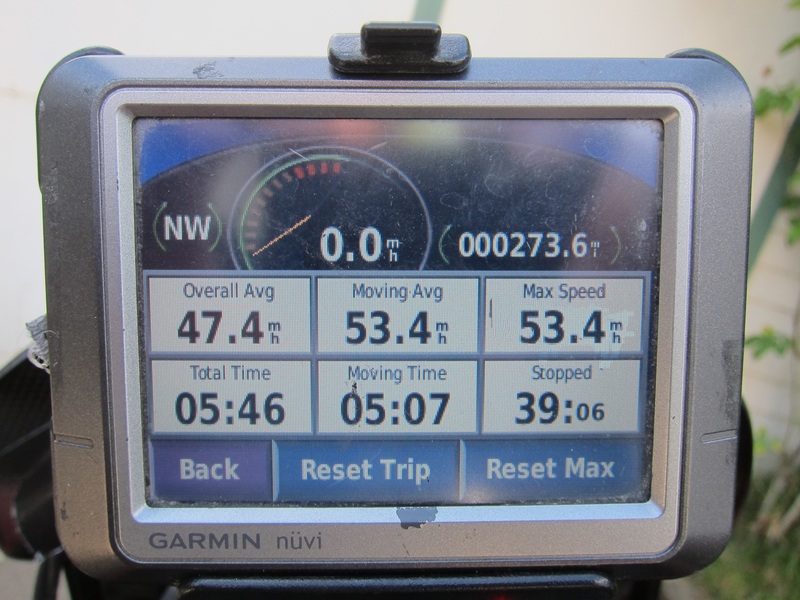 In case you are wondering, this Garmin GPS, a Nuvi 260 of more than 5 years, was designed for cars and not motorcycles. It is not waterproof and it has been in the rain a few times but it continues to work. The Oregon 450 that I have, which is an outdoors handheld type GPS, has connection problems between its mini USB and the DC power. Not very good for the bike. Meanwhile I’m in between a Garmin Montana and a 350LM as a possible upgrade. Bikes tucked away, the only wall of the garage that has been reorganized. Next there will be a ride to the Evergreen Museum in McMinnville, a short tour with the Triumph including a visit to a 1939-40 Packard, and a tour of the Cascade Lakes Rd., which I completed yesterday. These rides will offer plenty of materials for weekly posts, with nice inspiring photos and good stories to share with you in the next few weeks. 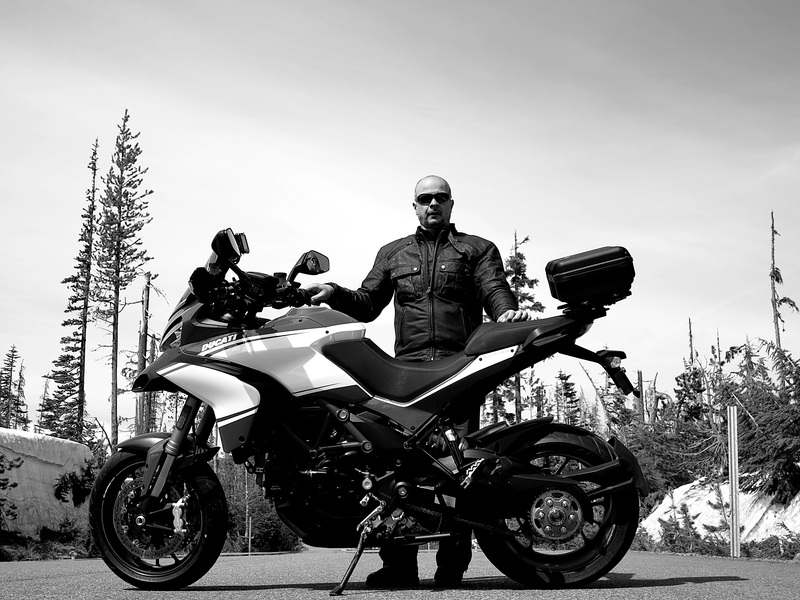 This entry was posted in Riding the Ducati, The Book. Bookmark the permalink. I don’t blame you for ignoring your writing and riding everywhere. There will be lots of rainy days ahead for documenting your rides. Your garage looks so clean and tidy. You probably have the same problem as me, turning them around to face outwards. We need to design some sort of turntable to make it easier. You haven’t seen the other side of the garage, and the back of it. I only shared the good side, and even the good side still needs some work. And I have to make gates for the lean-tos and a few other improvements. I have been thinking about this garage’s half improvement (it needs a lot more work than that, but at least I need to have something done for now) for a while. The time has come to complete it. I like the idea of the turn table. I usually turn them in the driveway where there is more space. 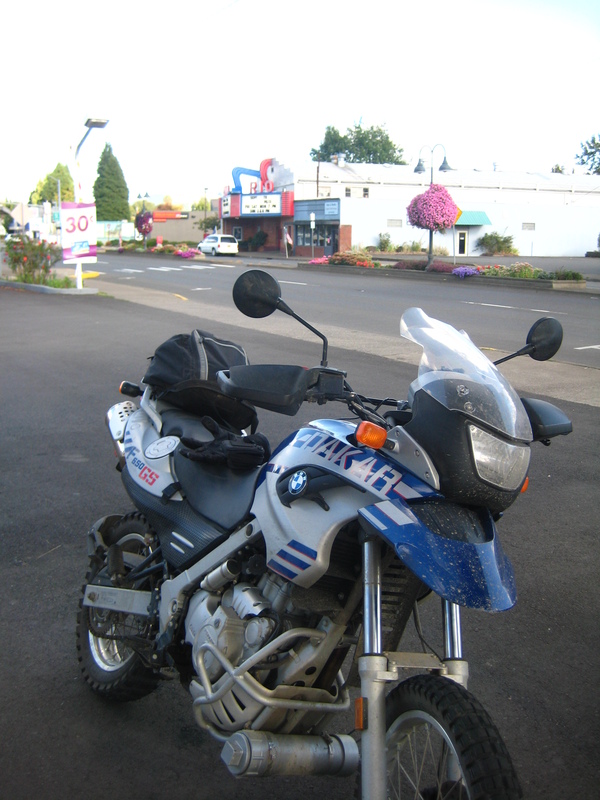 But with the Dakar, I used to turn it on the green grass area to the side of the garage, I would just ride a loop there and come back to the driveway facing the street. You are lucky that in Canada you can buy non-ethanol gas. That think is horrible for motors, fuel systems, tanks. I know, I used to have a car that ran ONLY on ethanol when I lived in Brazil. Plus, ethanol is subsidized, and costs a lot of energy to produce it and it brings the price of corn up. The Mexicans know it and feel the impact on their daily staple. Hope you had a nice day and things are good for you, Bob! A very nice ride report. Diamond Hill Road is a nice was to scoot across the valley and the twisties on the way to Brownsville on the East side are always a treat when they aren’t full of bicyclists on a road race. Have I mentioned before I hate riding through Sisters mid-summer? My clutch hand gets sore because of the slow pace through town and then there is the heat because of the little air flow as you sit in traffic. It was definitely designed for tourists and not travel. Cute town though. Looking forward to your other ride reports. The trick in going through Sisters is to take the parallel road to the main road. Makes it a lot easier when there is too much traffic. About my coming reports, I had never been to the Cascades Lakes rd. Impressive on its first set of miles leaving Bend and going past Mt. Bachelor. Nice reading. 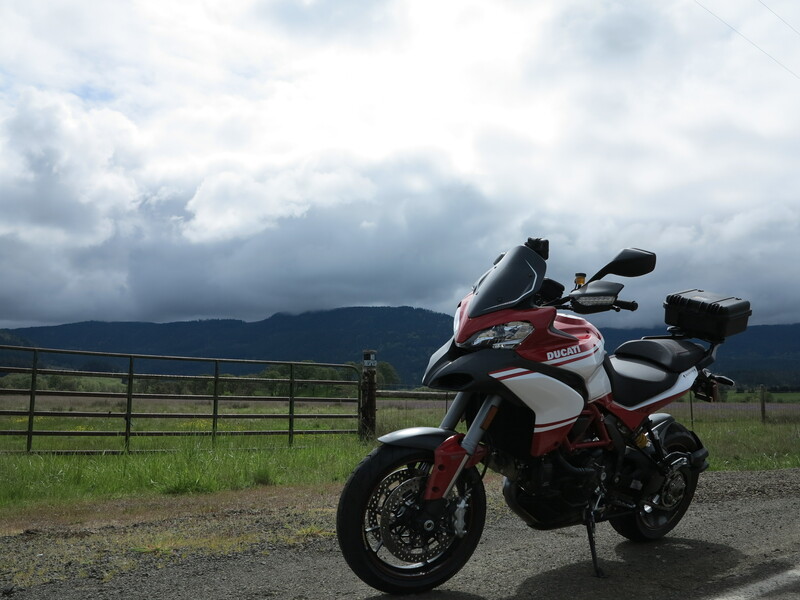 The Ducati photographs really well, its a beautiful bike. I was in Sisters in 2010 during my cross country tour, loved that area, specially the roads around all the lava where there’s an observatory. Would love to go back to Oregon. Thanks George. The road you are talking about is the McEnzie Pass road, the Hwy 242, it is one of my favorite roads here. It is open between June/July and October every year. This year, with the low levels of snow you had this winter, it should be opening earlier, I think this very weekend now. 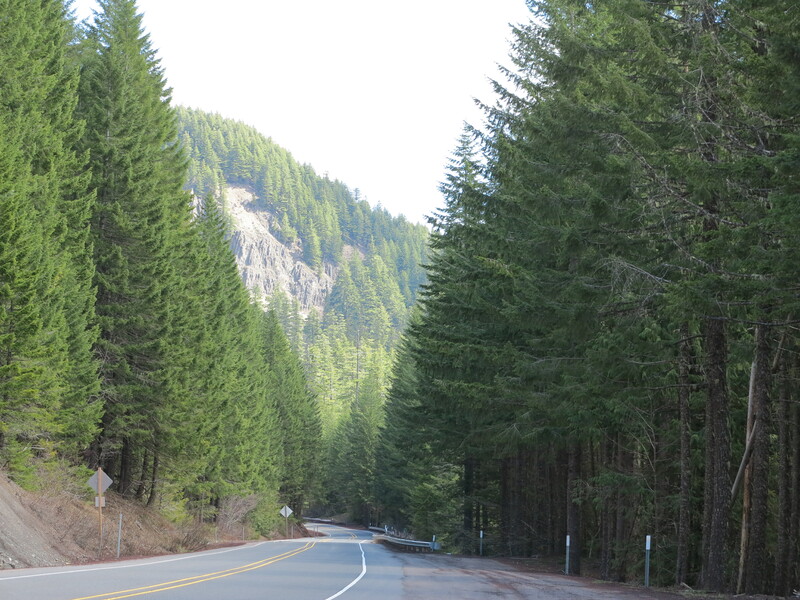 Another nice area is the Cascades Lakes Road. I was there last weekend and will report soon on that ride.